Two ways to remove it. Stanley blade and use sideways, just the blade only and scrape it backwards over it. Or you can get stuff you spread on the old silcone that will let you then wipe it off. They were resealed and the push test works fine. A two or three seconds until the woofers are back in position. Resealing was quite an exercise for the first time but I’m confident that it will take less time a next time and will also be done better. Soundwise they are keepers - that was clear from the first seconds. I noticed that they are a little more difficult to drive now they are sealed. I feel that the Nap 140 is a bit on the weak side. A bit more bass control would be appreciated. But instill need to do the A5 soldering and I know that there is a positive gain going from k20 to A5. Im reluctant to post an overall photo yet - the sideboard need to move to a different location and there are some spots on the wall which requires touching. Also, the final positioning needs some work. They behave a bit different being resealed. A little more bass which could imply they need to move an inch forward. Alas, I have a busy life and no much time the coming week. Interesting grilles. Can I ask who makes them? Your comments about the NAP140 are noted. You might need to consider a NAP250…or even better… two NAP250s (“olives”, naturally). A certain Mark from the Fishy place. Don’t think I can give more precise pointers, but this should be sufficient. The grills are of such a quality that they will definitely survive lets say a football shot to the SBLs or a toy car thrown against them (shock / horror - but these things happen :-). What helped here is that the Velcro on the SBLs was like new. Ah yes, of course; he does very nice foam grilles as well. And amusingly, during our correspondence concerning my sibbles (black ash like yours), we established that he went to school with my cousin (who has the same name as me)! Wow that’s different! 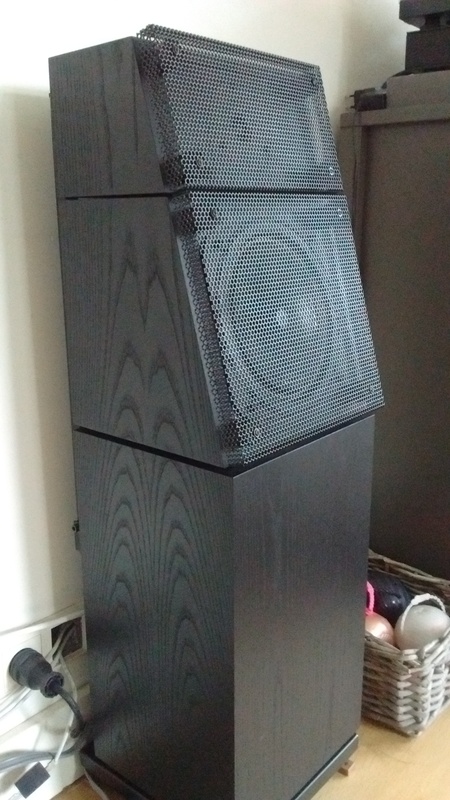 I don’t mind the mesh look, at least on black speakers. My own SBLs are currently naked, the foam having turned to powder after 24 years. I bought a spare set years ago from the guy in the US who makes copies. Stored them in a safe place, a very safe place as it turns out, now I can’t find them!